I finished this book a long while back, but I did not review it immediately since I had a headache. I am not feeling better at all, but I'm eking away at the "four books behind schedule" message I noticed this evening. (I don't at all expect to read as many books as I guessed I would this year, but it's a fun game! )So this book helped me understand a good deal of what ails me so regularly, so I am very positively inclined towards Paula Ford-Martin. Um, to fix the dilemma...? I don't have an exact answer here. There are a couple of things... Namely (what I'm focusing on) getting official advice tomorrow on my head problem.I'm pleased since I got in the mail a copy of my neurologist's form to SEPTA explaining my issue. It's not exactly what I said, but it is close enough. 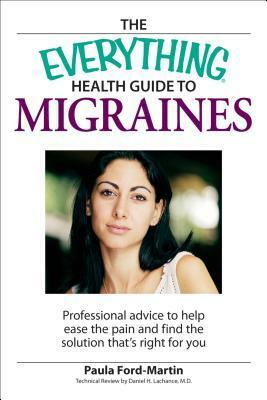 being a migraine sufferer my whole life, i already knew most of this stuff. however, the diet part did have some new information for me. it did a great job explaining WHY certain foods are triggers. i'm more likely to remember not to eat them now that i know why they may cause me to have a migraine.i think i may chart for a while. i've not done a food chart in probably 10 years, but, i've learned some new things about food from this (plus i am old enough and big enough to control my own diet now - so, it may be worth it). Useful information for anyone who has to cope with migraines.